As a pet owner we know that fleas, ticks, mosquitoes and worms are bad. But what can really happen if our furry friends get attacked by a disease carrying pest? Here is a list of the most common diseases that fleas, ticks, mosquitoes and worms carry and how it affects your pet. 1. LYME DISEASE: Transmitted by deer ticks this can cause fever, weakness, loss of appetite, and lameness. In extreme cases Lyme disease has resulted in kidney failure, seizures, and paralysis. If contracted, Lyme disease generally is treated with medication. 2. 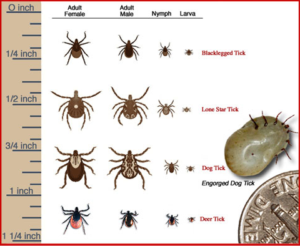 ROCKY MOUNTAIN SPOTTED FEVER: Transmitted primarily by Rocky Mountain wood ticks and American dog ticks that are infected with Rickettsia rickettsii. In mild cases this causes fever, arthritis, difficulty breathing and swelling. If left untreated, this disease results in damage to blood vessels and the inability for blood to clot. This is a life-threatening disease that can be treated with antibiotics if caught in time. 3. 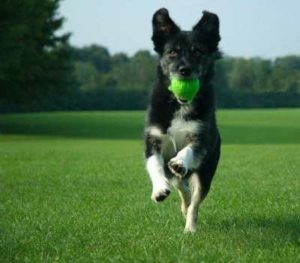 CANINE EHRLICHIOSIS: Transmitted from infected Brown dog ticks and American dog ticks this is a very serious disease. It directly attacks the hosts’ white blood cells affecting the liver, spleen and lymph nodes. It is very important to catch this disease early to prevent death. Acute cases can be treated with antibiotics; however, in severe cases blood transfusions have been used. 4. TICK PARALYSIS: Transmitted from the toxin in tick saliva from prolonged feeding. For paralysis to occur a tick would have to be feeding on the host for at least 4 days. This is a life threatening disease that causes a progressive paralysis until death. The only way to avoid is to prevent tick bites and promptly remove ticks. 5. 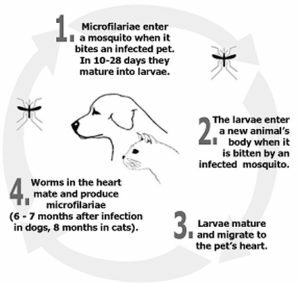 HEARTWORM DISEASE: Transmitted by infected mosquitoes this disease can eventually cause heart failure and death. There are separate medications to kill adult and immature heart worms. Contact your veterinarian for more information. 6. 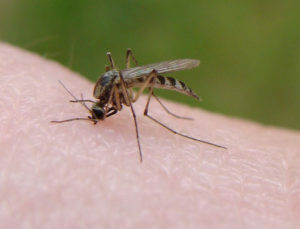 WEST NILE VIRUS: Transmitted by infected mosquitoes this disease attacks the immune system. It can also cause convulsions. The only treatment is to provide medicine for the symptoms. It will not eradicate the disease. 7. DERMATITIS FROM FLEA BITES: Transmitted by flea saliva. This is an uncomfortable allergic reaction that can cause reddened skin and hair loss. Treatment is to eliminate the fleas through flea wash and flea medication. 8. TAPEWORMS: Transmitted from infected fleas can usually be spotted from an increase in appetite resulting in weight loss. Tapeworm medication from your veterinarian is the only way to get rid of tapeworms. Only with our help can dogs and cats avoid these diseases. Make sure your pet is up to date on shots and is given the proper medication to prevent flea and tick bites. Be diligent in mosquito repellent and remember to check for ticks regularly. 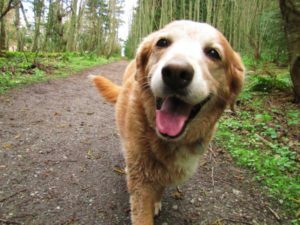 With this knowledge your pet will live a happy, healthy life.